Personally, I think The Vaults is one of the most brilliant venues in London. Not only because it's home to some wonderful shows but because it is so versatile. Every time I've visited the mystical underground theatre, I've been overwhelmed by how different it looks. Set designer Max Dorey has done an outstanding job of transforming the space for Teddy into a cool, rustic, junkyard with so much to look at. From a (creepy) doll in the corner, to a car bumper, to a giant T, every detail has been meticulously picked out and the small space feels vast but homely at the same time. Now onto the show. Teddy tells the story of two young teens, Josie and Teddy who are out for a good night in London town. It's a story about the birth of new music and the rebellious youths of 1956. Featuring a live onstage band 'Johnny Valentine and the Broken Hearts', this show is fresh, exciting and energetic. 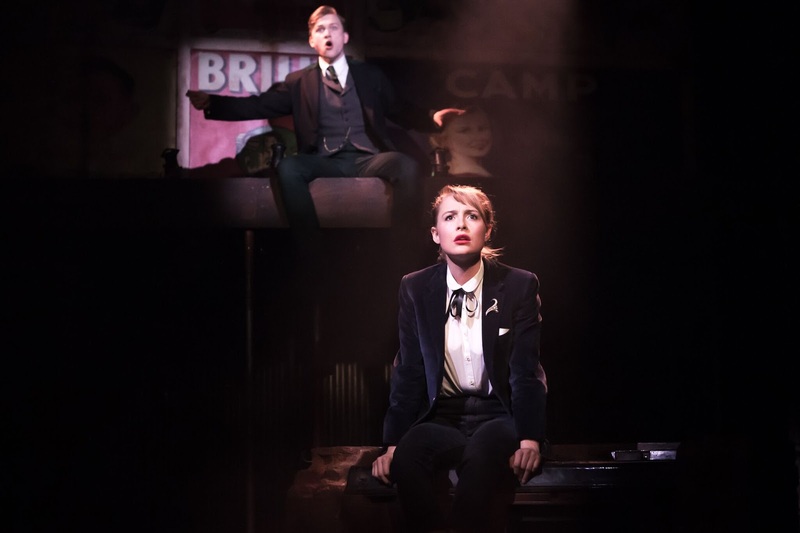 The ridiculously talented duo Molly Chesworth (Josie) and George Parker (Teddy) take on this unique script with such ease and grace that it seems they were born to play the roles. The story is written using rhyme as well as normal speech which makes it jumpy but lyrical at the same time. Both actors speak the poetic text so naturally that you forget it's not a 'normal' way of speaking. Adding to this, they also take on the roles of all the other characters. Twisting and contorting their bodies and voices to become the other people they are very effective. The story line is pretty simple and I must admit that I did find the first half dragged somewhat but the second act has a Bonnie and Clyde feel and there are unexpected twists and turns. If I were to change something, I would cut some of the earlier dialogue and make the show 90 or so minutes straight thought. I think this would keep the pace going and not allow time for our minds to wander. Tom Jackson Greaves' and Eleanor Rhode's choreography is perfectly fitting with the show and had me out of breath just watching! The movements work very well in the small space and manage to convey the excitement of the era of change in terms of clothes, music and everything else. The onstage band are wonderful. Made up of Freya Parks, Dylan Wood, Andrew Gallo and Harrison White, they provide a soundtrack of original music (by Dougal Irvine) which has us tapping our feet and feeling truly immersed in the era. The post-show gig is an innovative and joyous way to end your night- I'd definitely pay to see Johnny Valentine and the Broken Hearts on a sold out arena tour! 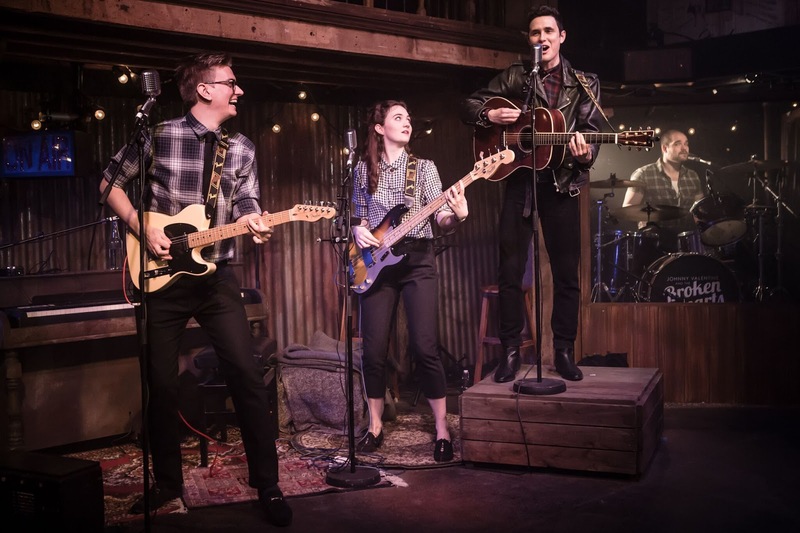 Teddy is an innovative show which uses everything it has to it's advantage whilst showcasing fantastic musicians, incredible actors and an exciting story. Like nothing else I've recently seen, Teddy is the refreshing show you need to get a ticket for. Get "ready Teddy to go" along to The Vaults and don't miss this show!